For many of us — white people born and raised in the South and descended from southern families with long histories in this land — recent conversations resulting from Dylann Roof’s act of fatally racist terrorism in Charleston have been difficult. Specifically, given Roof’s self-admitted affinity for the Confederacy and its symbols, much debate has turned to the Confederate battle flag, other Confederate symbols and the history and meaning of the southern rebellion. The debate has provoked quick responses of defense or middling excuse-making from people like us. I understand this response. In the past, I’ve had the similar kinds of responses. I know the debates seem personal, eliciting feelings we’re perhaps not used to addressing and causing us to confront emotions and certain uncomfortable facts about our families we’re not accustomed to having questioned. And, maybe, other people don’t understand why it’s so emotional. Why something that happened so long ago could seem so personal. “The Civil War ended 150 years ago,” you’ll hear others exclaim. “Get over it, already,” they’ll add. But, still, you have difficulty setting aside personal biases and confronting the truth. You’re born into a big family, with a long history in the South. Your elders — grandparents or great-grandparents or aunts or uncles — fill family reunions and holidays with stories of family members long gone. Family history and genealogy are forefront. Legends and folk stories of family members are passed down from generation to generation. You might be able to trace at least one line of your family prior to the Revolution and at least one ancestor served in the Continental Army. Military service in your family continued into the next century, and one of your forefathers, if not more than one, fought for the Confederacy. You know where they’re buried. You’ve seen their Confederate tombstone. Heck, someone in your family might have even arranged to have a formal Confederate tombstone commissioned by the U.S. Department of Veterans Affairs (yes, they still do this). You’ve been taught your entire life to be proud of your family heritage and history. “Heritage not hate” is more than a Facebook meme; you’ve heard it all your life. All those folk stories and legends told you that your great-grandparents were heroes — gallant knights who rode off to war to defend their families and their homes against an angry invading force during the great “War Between the States.” You grew up whistling “Dixie,” damning Sherman’s March to the Sea and all the great troubles caused by the “War of Northern Aggression,” commemorated in songs like “The Night They Drove Ol’ Dixie Down.” You defended the Confederate battle flag and maybe even flew it in your youth. And, because of this history and your youth and your family and because of all the times you’ve studied your genealogy and read your forefathers’ names and wills and letters and visited their graves, you begin to see yourself in them. You begin to think you know them. That they have some sort of real impact on your life today, as if they’re here with you now. Then someone comes along and calls them white supremacists, racists, rebels and traitors. Then a tragedy happens and people lose their lives and others compare this terrorist to your ancestors. And you shut down. Because that’s not the kind of story you heard growing up. That’s not the vision of the valiant hero of the “Lost Cause” you thought you knew. That’s not the “accurate” portrayal of men who simply sought to protect their families, keep them fed and keep them safe, you tell yourself. But — as hard as it is to hear it, as much as no one wants to see their family heritage turned over into a collective history of hate, treason and violence — every bit of this criticism is true. Not only is it true, it’s criticism we must embrace. We must throw off our Lost Cause-colored glasses and see our histories for what they are. We must acknowledge and admit the realities of the pain, suffering, death and despair it caused millions of human souls. 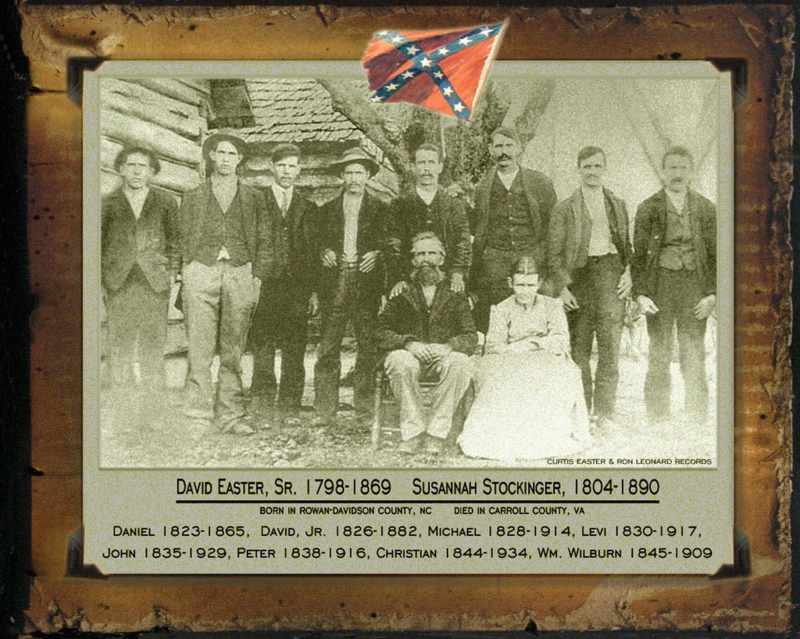 A graphic created by distant relatives, depicting my fifth-great-grandfather David Easter with all eight of his sons, among which two, Levi and Michael, are also my third- and fourth-great-grandfathers. Each of the brothers served in the Confederate Army. These people — these men in my family — they did not fight for freedom and honor. They did not create businesses to benefit the economic spirits of all people. They did not create legal policies or political campaigns that sought equality and reconciliation. Instead, they fought for slavery. Instead, they created businesses whose very livelihood traded in the very real lives and bodies of other people. Instead, they created legal policies and political campaigns that — after slavery was abolished — enabled “slavery by another name” and denied black citizens their full and equal station among the citizens of this nation and world. This is the truth. An ugly, uncomfortable one, but truth nonetheless. And if we ever have any hope of moving this nation toward racial reconciliation, white people like me, like you and like so many others will have to acknowledge this past. We’ll have to stop whitewashing reality. We’ll have to quit treating traitors and white supremacists as heroes, even if they’re among our own family trees. We’ll have to look deeply inward and ask ourselves tough questions. Do we really want to be associated with this history of hate and racism? Is this something we really want to celebrate as pride and heritage? We can cast off old family heroes and choose them anew — heroes like my grandfather, who decried the evils of the Ku Klux Klan instead of encouraging their violence like B.B. Comer is once thought to have done. A hero who had a sense of shame and regret when telling me about distant cousins who were, even nearly 150 years after the end of the Civil War, still members of the Ku Klux Klan. A hero who, when integration became the law of the land, taught his daughters to treat all their fellow classmates with respect and began to challenge his own views, remaining loyal lifelong to a Democratic Party increasingly more tolerant, more equal, more steadfastly and firmly committed to the ideals of equality and justice for all. Additionally, we can choose to take our “Lost Cause” mythology, celebrations of hate and slavery and symbols of treason and violence like the Confederate battle flag and relegate them to history, not the present. Put them in museums. Put them in your family’s historical files. Move Confederate monuments to cemeteries. But, most importantly, we can choose to turn to our black neighbors and friends — many of them descendants of the very people our families once owned and fought to keep in chains. We can choose to hear their words, their stories, their emotions and feelings and all the things we’ve failed to hear over decades and centuries of making sure we were the ones who had singular, ultimate, God-like control over their lives and minds. This choice is ours and ours alone. This responsibility lies with us, because people like us — people whose blood flows through our very veins — first set up these systems of slavery, disenfranchisement, convict leasing and other institutional ills under which others have suffered and we have benefited. We’ll have to make this choice and work hand-in-hand with the people our forefathers once sought to silence. Together, we’ll ensure the mistakes our ancestors made are never repeated. Together, we’ll put America on the path upon which we first started when other heroes — people like my seventh-great-grandfather, Michael Easter II, and perhaps someone else in your family — took up their duty to fight for a nation founded on the self-evident truth that all men, including ultimately black men and women and everyone in between, are created equal. That’s the kind of heritage I want. That’s the kind of heritage we should choose. That’s the kind of heritage we can create for our descendants. Starting today, tomorrow and every day after. The day the Stars and Bars came off the truck. It’s been on the truck since the truck came into my life. The truck’s owner was seriously into genealogy and history and I took it in that spirit and left it in place. I was never ashamed of my ancestors service in the Confederate Army….That was then and this is now. Then I read the manifesto of a young murderous racist that was lavishly illustrated with his worship of that flag. It sickened me and even though I had never thought of the flag that way, I knew that to remove all doubt about my allegiance to my country and its dreams of equality and strength in diversity, the flag had to come off the truck. My family was Confederate for less than 5 years. We’ve been Americans for over 200. It’s time to take a stand. Mr. Comer forgets and does not mention that his ancestors blood likely also flows in the slave held decendants. THEY ARE KIN and cousins. I don’t understand what you mean. Well, I understand the statement but not how it is relevant to what Matt wrote. Rebecca, Thanks for commenting. I certainly did not mean to imply a strict separation between white and black southerners and didn’t intend to ignore their connections. Thanks for commenting. Articulate and extremely well reasoned. The ony thing I would add is this. You don’t have to be from the South to embrace the dark side of it’s culture and heritage. Whether you are or not and even if you are not a rabid racist, you condone it, quietly nod agreement, support it and contribute to it’s spread every time you fail to speak out, challenge it for what it is or even simply stand quietly by. I did that when I was growing up in the South, stood silently by, and occaisionally joined my friends in their racist rants if it made me part of the group. I knew better and I still said nothing. I’m not willing to do that any longer and I call it for what it is whenever I see it. The young man that committed murder in Charleston wasn’t born with hate. He learned it. When are we as a society going to stop teaching it, South, North, East or West. Thank you for writing this. As a Yankee living in the south, I pretty much stay out of these discussions. I get that I’ll always be an outsider on all issues “southern” and I get that I’ll probably never really get what being southern means to southerners. Your thoughtful, soul searching post gave me a peek and a little more understanding and I appreciate that. I’m glad southerners are having this conversation. I hope they will be wise and let go of a symbol that has way too much toxic material woven into it to be worth holding on to. Aycock should not be associated with that flag; it went out when he was six years old and came back long after he was dead. What other governor has ever threatened to resign to protect the education of black children, or for any reason? Just this week, Justice Anthony Kennedy said in the marriage rights case, “The nature of injustice is that we do not always see it in our own time.” If you want to see injustice, I will send you a long list of published false accusations against Aycock, including this past Sunday in the Greensboro News Record. Jim, I empathize with how you must feel. But, this — “Aycock should not be associated with that flag; it went out when he was six years old and came back long after he was dead.” — isn’t quite accurate. The Confederate battle flag was extremely popular during the Civil War and continued to be popular since that time. Mississippi adopted it into their state flag in the 1890s. The Ku Klux Klan and other groups began using it early on, as well. Groups like the Daughters of the Confederacy etched it into the statues they erected during Aycock’s time. It took me really grappling with issues of white supremacy in my family to come to this conclusion. It was difficult. I think Aycock’s legacy is complicated, as is the legacy of my ancestors. We have to deal with that honestly. Yes, my ancestors did great things, much like yours (I’m assuming your connected to Aycock, just going off the name). They also did very bad things and we can’t whitewash that. He was my great grandfather’s brother. I have no illusions about Charles Aycock and those days. My interest is an inch wide and a mile deep. There have been many published accusations of things he did not do, I have them documented if you want a list. Last Sunday he was accused in the News Record of having the same wish as a man who killed nine black worshipers in their church, to begin a race war. Nothing could be more false. There have accusations that he helped torch a building and participated in murder, and I am not talking of allusions but direct accusations. If you don’t think that is injustice, what would it take? Certainly, by all means, if there are untrue accusations, address them. But I still think we can include Aycock, regardless of all the great things he did, in the same or similar camp as other racist “Redeemer” Democrats, including those in my own family. It’s unfortunate, but true, that both our ancestors were white supremacists. It’s okay to admit it. The official state report, the most authoritative source, does not place Aycock in Wilmington at any time before, during or after the riot. It does not say he advocated, helped plan or participated in violence. It makes clear that his role in the White Supremacy campaign was as a party line speaker but not in Wilmington. Aycock’s friend Henry Connor is quoted as hoping violence can be avoided. The report says the armed coup at the city hall was planned in advance by various secret groups of Wilmington Democrats, but that the bloodshed was unplanned, not organized in advance. The report quotes Aycock the day after the riot in a letter to Connor as regretting the events in Wilmington greatly. He is the only Democrat quoted in the official report as expressing regrets for the riot (chapter 6, page 188, footnote 92). Your commentary is raw, real, and refreshing! Well, Matt, I am not sure why you sent me this two year old stuff again, but I will comment. Question: state and local law was clearly violated in Durham yesterday when protestors tore down a Confederate statue. What will be done about it? Confederate statues show men holding rifles, swords, riding off into combat to defend slavery. We can all agree that they were honored for things that are today considered bad. The statue of Charles Aycock shows him not holding weapons of war but holding a book. What he was honored for is still considered today to be good. That puts him into a different category from those who fought for slavery.